IDEA: Masculinity was different in the '70s. It was gentler, hairier, John Denver-ier. And it was captured memorably in the outdoorsy beer ads of the era from brands like Coors and Hamm's. Lately it's been recaptured, amusingly if ridiculously, by Deutsch/LA in parodies of those ads for Dr Pepper Ten, the male-targeted diet soda. 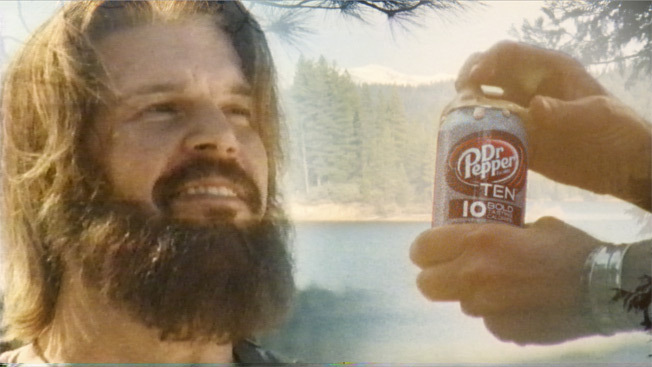 Dr Pepper Ten's mountain man is back in a new 30-second spot that dials back the absurdity of last year's spots and hews more closely to the source material. "There's something very masculine about those old ads and [TV shows like] Grizzly Adams. But at the same time, he hangs out in a meadow. We thought there was something charming and earnest about that," said Deutsch associate creative director Ryan Lehr. "We have these fond memories of seeing those ads while watching Wide World of Sports on Saturdays," added fellow acd Erick Mangali. "Last year we came up with these visual gags where you laughed out loud. This year we took a more sincere approach. I think it actually makes it funnier that way." COPYWRITING: The ad opens with the mountain man, played by Blake Gibbons, walking through the wilderness, paddling a canoe (with a bear helping him out) and drinking Dr Pepper Ten with a hawk perched on his shoulder. A heartfelt '70s-sounding song plays: "Look to the sky, listen to the trees/Out on a river, just a man roamin' free/Searchin' for that great-tastin' 10 calories/Bold Country, this is Bold Country/Ooooh, Bold Country." Gibbons says in a voiceover: "Great-tasting bold flavor. 10 calories. Dr Pepper Ten. Taste the Bold Country." The ad ends with a product shot in front of a flowing river, and then Gibbons at dusk in front of a beach fire, Dr Pepper Ten in hand. "Not a bad way to end the day," he says gruffly. ART DIRECTION/FILMING: Stacy Wall shot the ad in Placerville, Calif., on 16mm film, which gives it a cinematic look. The production company transferred the film to VHS and actually baked the tape, exposing it to heat, which gave it an aged look, said Mangali. Editors Frank Effron and Sean Stender of Cut+Run added some comically outdated effects, like a cross-dissolve. Wall, whose father was an account man a generation ago, really got into the project, too. "It was almost like a love letter to what his dad used to do," said Mangali. The guy in the bear suit—"one of the top three fake bears around," according to Lehr—was impressive on set, too. "He came out in his full bear suit and was doing this whole crawling thing," said Mangali. "I think he was getting into character. He even went over to the trash can and started picking through the trash. Our client happened to look up and freaked out, because she didn't know he was coming out. Then and there, we knew we had the good bear guy—that he could pull this off." SOUND: The creatives wrote lyrics and sent them to MassiveMusic, which tweaked them and set them to music. "There's something nice about this '70s style of music," said Mangali. "It's not overtly masculine, but it evokes this response from masculine guys. It's about nature and 'Rocky Mountain High,' but it's almost like this sensitive thing. There's an earnestness that almost makes it funnier." MEDIA: The spot launched last Monday on FX's Archer and will air nationally.